Firsts in anything is sometimes challenging, but may also open the door to new opportunities. For Darren LeBrun, P.E., P.S. Scioto County Engineer, his first year in office, brought for him both challenges and opportunities. According to the Scioto County Engineer Website, the County Engineer’s Department is responsible for the maintenance, repair, widening, resurfacing and construction of roadways and bridges on the County highway system. Scioto County currently maintains 414 miles of roadway. “I feel this first year went well, we had several highlights this year. At the beginning of the year, in March, we settled the Union contract, which is very important to the employees here, we got some production out of that same group, too. He said just this year, they cut right of ways along 31 miles, 55 miles of ditching, 49 miles of resurfacing, and put in 175 culverts. The county ran an equipment sharing this year, joint maintenance work, ditching and resurfacing work with the townships and the village of New Boston. Together, they filed a grant that could result in $600,000 for their roads. “This is an example of working together with other groups for the betterment of our county. So, I’m proud of that,” LeBrun stated. In the upcoming weeks the county will be jointly working with ODOT/OVRC on a feasibility study on Ohio River Road looking into an additional turn lane on Ohio River Road. “Everyday is a learning experience, you go in to accomplish something , you do your best, there is always something to learn from. I think the biggest thing is learning the best ways on how to utilize the manpower we have here at the garage. Right now, here at the garage, we modified the salt used in our roadway treatment to treat the roadways more effectively and also change the way we go out and treat them, ” he stated. One thing he spoke of doing differently next year is what time of year they do the culvert replacements. It was toward the end of 2017 and he plans to change that to during this summer, so as to not interfere with the school year and buses. Recalling those who have helped along his initial year, he mentioned the current employees, who he said are high quality people and have been a tremendous help to him. He also said he had like a mentor person, Clyde Willis, a previous county engineer, saying his advice was invaluable to him. “My family, most of all,” he said as he told of last Saturday the county workers were out treating roads and he missed his daughter’s basketball game. He said his family understands it is part of the job and they give him their support in his role. 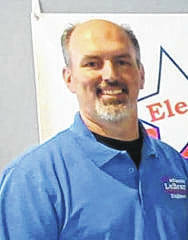 LeBrun stated future plans include hopefully working on the new grant project, traffic light replacement in Rosemount, joint work with New Boston on some guardrails, paving in the county and working with townships on the work they want to do on some of the bridges and roadways in the county. He spoke of the future of our county in the upcoming year.